Antique lights, or Edison Bulbs, have recently become incredibly popular. You can find these cool looking bulbs everywhere, from your favorite restaurant to DIY steampunk lamps and costumes. However, in the midst of this new found lighting love, some are becoming disappointed by the amount of brightness emitted from these beautiful bulbs. Before you decide to invest in a few Edison bulbs, you may want to get a better understanding of what you’re getting for your wattage. Today’s standard incandescent light bulbs have a pear shape, an average wattage between 40 and 150 Watts, and typically last around 1000 hours. Though standard incandescents are being phased out by more energy-efficient lighting such as LEDs, antique lighting is gaining popularity due to its creative vintage style. 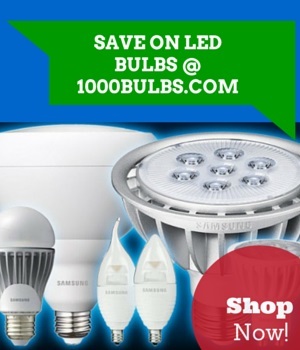 However, many people don’t realize that when they choose to use incandescent Edison bulbs in place of regular incandescent bulbs, they are losing some valuable luminosity—the brightness of Edison bulbs is actually lower than standard A19 incandescent lights. Most people don’t realize that watts are not the same as Lumens, aka brightness. Antique lighting does not have the same level of brightness, or the same Lumens per watt ratio, as standard incandescent lighting. Antique lighting is also typically lower in color temperature than today’s incandescents, meaning they are less than 2700 Kelvin, the standard for incandescent lamps. Vintage bulbs range between 1800-2400 Kelvin, producing a more orange light as opposed to the soft yellow glow emitted by incandescents. This is further exacerbated by the amber tint characteristically given to the glass of an antique bulb. You can think of the light from an antique bulb as being similar to the color of a flame, or sunrise/sunset. So, when purchasing antique bulbs for your home, be aware that a 60-Watt antique bulb will emit closer to 400 Lumens, whereas a 60-Watt standard A19 incandescent bulb will emit closer to 800 Lumens. But remember, these bulbs are for accent lighting, not task lights or to replace overhead lights. Before installing an antique light with a higher wattage, check your fixture’s wattage rating to make sure it can handle the additional watts. What if you really enjoy the look of these bulbs but want longer-lasting lights? Consider trying LED filament bulbs. LED filament bulbs use traditional-aesthetic components of vintage and standard incandescent lighting, such as shape and traditional glass shielded circuits. However, the LED emitters within the bulbs last for a longer period of time than the fragile incandescent filaments. With these lights you still get the vintage look of Edison light bulbs, but instead of only having about 1000 Lumen-hours, LED filament bulbs have approximately 15,000 life hours. However, this is much shorter than the average Lumen life of regular LED bulbs which typically last around 50,000 hours on average. This has to do with the type of LEDs being used in the filament bulbs along with fragileness and the possibility of overheating. While LED filament bulbs contain a lower wattage, you should still check the Lumens. With LED filament bulbs you get the same color temperature, so the effect is identical to traditional lamps–however, you won’t have to worry about a fragile filament or high energy cost. This warmer light in vintage inspired glass creates a softer glow, similar to that emitted by standard incandescents. Whether you decide to invest in LED or incandescent antique-style lighting it is important to weigh your options. With LED filament bulbs you will get more Lumen life and a warmer color temperature, whereas with incandescent antique lights you may have a few more bulb style options, but a shorter lifespan. What have your experiences been with antique light bulbs? 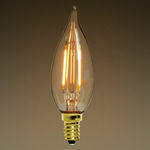 You can also see what other people are saying about these bulbs by checking out the fantastic reviews. Don't forget to leave us a comment below, or as usual pop over and talk to us on Facebook, Twitter, Google Plus, LinkedIn, Pinterest.